Our argan based hair oil recipe is an absolute dream for your hair! Soft, hydrated locks are just a recipe away. Benefits: We used argan oil as the base of this recipe because it’s so amazing for your hair. Filled with vitamin E, it is great for promoting hair growth and nourishing your hair and scalp. It helps to fight dandruff and dry scalp, strengthens hair, and can even help to reverse damage caused by styling tools and chemical treatments. The carrier oils and essential oils you chose all have their own unique benefits. Variations: All carrier oils have great hair benefits but for maximum results, choose one that is best for your hair type. Avocado is amazing for dry, damaged hair, and it helps to stimulate hair growth. Apricot kernel oil is nourishing and lightweight, so it won’t weigh down fine hair. You can also customize your essential oils for your hair. 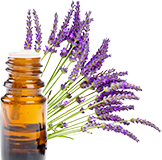 Dry hair will benefit from lavender, cedarwood, and chamomile, while lemon, cypress, tea tree, and peppermint are great for oily hair. Rosemary is wonderful for all hair types. Tips and Tricks: This oil isn’t just for your hair—be sure to massage it into your scalp to promote hair growth! This is a small batch and it’s great for testing out, but you can easily make a much larger batch if it’s something you plan on using frequently. How to Use: Massage into your hair and scalp and let sit at least 1 hour (overnight is best!). Then shampoo and condition to remove oil (you may need to shampoo twice—which you should be doing anyway! Watch the video below for a step-by-step tutorial for making this DIY hair oil recipe. Using a funnel, pour all of your ingredients into a dropper bottle. Warm in your hands slightly before applying and massage into hair and scalp.